Physics Buzz: Discovery over D.C. It's a bird. It's a plane. It's...Space Shuttle Discovery. Tomorrow morning (Tuesday) between 10 a.m. and 11 a.m. Eastern Time, the retired Discovery Space Shuttle will fly low over Washington, D.C. en route to Dulles International Airport in Virginia. Onlookers will be able to see the spacecraft from the ground at several D.C. landmarks. Discovery won't make the journey from Florida to D.C. alone, however: the spacecraft will piggyback on NASA's 747 Shuttle Carrier Aircraft. Discovery's journey kicks off a week-long celebration of NASA's transfer of the spacecraft to the Smithsonian Air and Space Museum for public display. Shuttle Endeavor on top of NASA's Shuttle Carrier Aircraft. Image Courtesy NASA. Since the retirement of the Space Shuttle program last summer, NASA has been working with museums and science centers to relocate the shuttle orbiters for public display. Many locations competed to house the four coveted orbiters, and NASA's eventual decisions last year were met with controversy. For the best locations to see Discovery's flyby tomorrow, take a look at this map provided by the Smithsonian Air and Space Museum. The best locations in and around Washington, D.C. to see the shuttle's approach to Dulles International Airport. Great views can also be seen from the Udvar-Hazy Center in Chantilly Virginia. Discovery certainly has already made a lasting impact on the history of manned spaceflight. Since its first flight in 1984, the spacecraft has traveled almost 150 million miles, deployed 31 satellites, and docked with the International Space Station 13 times. 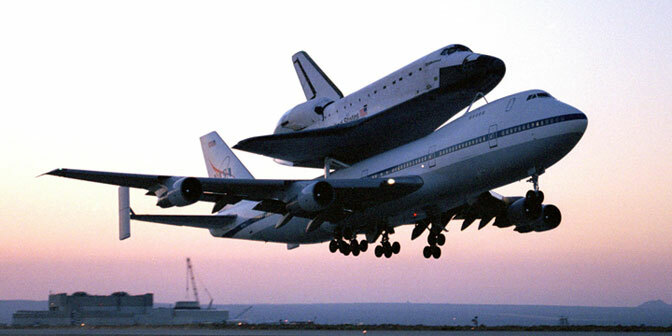 For more facts about Discovery and its sister shuttles, take a look at this NASA webpage.